Yin yoga is a slow-paced style of yoga with simple poses that you have to hold for slightly longer than you usually do while practicing other yoga styles. Founded by martial arts expert Paulie Zink, it is gaining popularity gradually, even though it was first taught in the U.S. in the late 1970's. Initially called "Daoist" yoga, Yin yoga focuses on the deep connective tissues of your body and helps regulate the flow of energy within the body. Paul Grilley, a student of Pauli Zink, played a role in bringing this yoga style to the forefront. 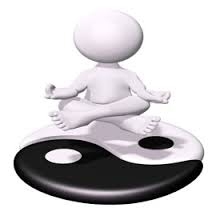 Yin and yang, or simply Yin-Yang, are two philosophical ideas from Daoism. It explains how two opposite forces can be interconnected, interrelated, or interdependent in the natural world. These philosophical ideas also describe how those opposite forces boost each other when they interrelate. At the very core of it, Yin yoga is a posture practice and resembles Hatha Yoga. The idea became known to the world when a couple witnessed Paulie Zink holding several poses for 20 minutes or so to become incredibly flexible. The couple gave this practice the name "Yin yoga" and added it to mainstream yoga. The basic goals of Yin yoga are the same as any other type of yoga; the only variation is that it focuses specifically on deeper muscular tissues. In other words, its yoga asana targets your bones, ligaments, and even the joints of the body. Softness: Your muscles aren't hot or warm; instead, they are cool and relaxed. It also describes that yin yoga isn't a form of restorative yoga. Stillness: You need to stay still without fidgeting, moving, or adjusting – unless of course there's pain. Steadiness: You maintain the posture passively for 3 minutes or more. If you don't follow these three basic principles, what you're doing is NOT Yin yoga. Yin yoga focuses more on connective tissues, whereas Yang yoga involves the lengthening and contracting of your muscles. You can take Yin yoga as a perfect complement to its more dynamic and muscular counterpart (Yang Yoga). By digging deeper into the details, it will become evident that Yang Yoga involves Hatha flow and similar practices. You will be utilizing your muscular energy combined with alignment principles to strengthen your body. Yang Yoga involves the compression of your internal organs only. Yin yoga disengages muscles and works more with your joints and bones. Yin yoga is more about getting flexible than gaining strength. In Yin yoga, you have to feel the compression of your bones and muscles, and have to release the muscles in the process. This makes your bones stronger and prevents issues like osteoporosis. Moreover, you will be holding your posture longer with more conscientious attention to the breathing in Yin yoga. This opens up your body and makes you feel more energetic. Yin yoga improves your body in a number of ways. Here are some of the benefits you get by following this school of yoga:You will feel balanced and calm. You will be able to regulate energy levels. You will experience greater strength. You will enjoy better stamina with lowered stressed levels. You will notice flexibility in your joints and connective tissues. In addition to these benefits of yin yoga, you may experience some extra, such as deeper relaxation, improved medication, slowed signs of aging, and improved practice of Yang Yoga. This yoga form is also quite beneficial for anyone undergoing eating disorder treatment or seeking trauma recovery. It's a great posture to stretch your lower back. It also helps remove heaviness in the testicles and is good for kidneys and prostate gland. Start from a seated position and bring the soles of your feet together. Slide them away while letting your back take an arched shape. Fold forward and place your hands on the front of your feet. Make sure your head hangs down towards your heels. Hold this posture for at least three minutes and then move up by pushing the floor with your hands. Come back to the starting position very slowly. It's great for arm flexibility and decompresses the sacroiliac joints. Lie on your back and place your knees close to your chest. Hug your knees by grabbing the ankles or the soles of your feet. Open your feet apart and keep them above the knees. Pull your knees and chest towards the floor and keep your head down to the floor. Maintain the posture for at least three minutes and release the feet first to get back to the starting position. It's a great way to open the hips, as it involves external rotation of the front hip. It also provides your quadriceps a nice stretch. Roll your right knee between your hands and lean to the right. Flex the foot and slowly move it forward. Center yourself once again and maintain balance. Slowly slide your back knee away while making sure the back toes are tucked under the knee. Maintain the posture for 3-5 minutes and push the floor with your hands to come up and return to the starting position. This asana works great to stimulate the kidneys and also massages your heart lightly. It's a great posture to cure impotency. Sit on the floor, keeping your legs straight. Slowly round your back while moving towards the floor. Keep your hands relaxed and maintain the posture for 3 minutes or more. Push the floor away with your hands to return to the starting position. The asana helps you stretch your quadriceps and hip flexors. It helps a lot to prevent sciatica. Start on hands and knees, and slowly place one of your feet between your hands. Take your front foot ahead until your knee is exactly above your heel. Take your back knee forward slowly and place your hands on the front thigh. Slowly lift your chest while increasing the weight over your hips. Hold it for a 3-5 minutes and move back to the starting position. Server responsed at: 04/24/2019 6:13 p.m.